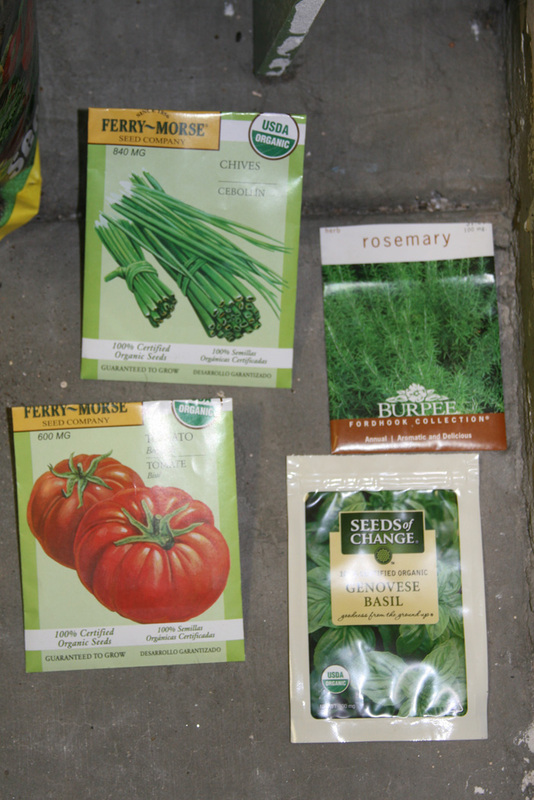 Well, for good or for ill, I have opened up four packets of veggie/herb seeds, and planted them in a starter situation to see what happens. I took spent newspaper rolls (biodegradable – and good for your compost bin, as well! ), cut them in half and planted them firmly inside of a the bottom of an egg carton. I filled each half-roll with organic from-seed dirt, planted the seeds, took a deep breath (and yes, maybe even sped through a prayer), and set them aside after wetting them down. It feels late in the season to plant. But in Arizona, there is no such thing as spring frost. So the weather is probably more than perfect to coax a seed to sprout. Why am I so hesitant, though? Well, my sordid history with plants looks more like willful herbicide. I’ve taken home plants from the store all excited to repot and start my much-sought after garden. Yet within a week, most have bitten the proverbial dust. The best I did was an indoor ivy, before spider mites made a feast of it. And with three all-too-curious cats and very few light-heavy areas in the house, I just gave up on growing anything for a while. The sample specimen hopefuls are: Organic Genovese Basil (because it sounds aromatic, and possibly good for future recipes), organic beefsteak tomato (c’mon, the whole point of a garden is having tomatoes! ), green onions (yum), and the queen of the crop, the wonderful smelling rosemary. Even if I don’t use rosemary for food, as it can be overpowering, just using it as potpourri will make for a happy household. Rosemary germinates within 14-21 days, so if I’m lucky, it’ll be ready to call a pot a home by April 21 or so. Chives/green onions are 15-21 days, so it should be about the same time I see those shoots…if all goes well. My belov’d tomatoes, on the other hand, are much more eager. Within a week’s time by next Sunday, I could see sprouts. God, here’s to hoping! The basil is just as eager, with a 5- to 10-day germination period. 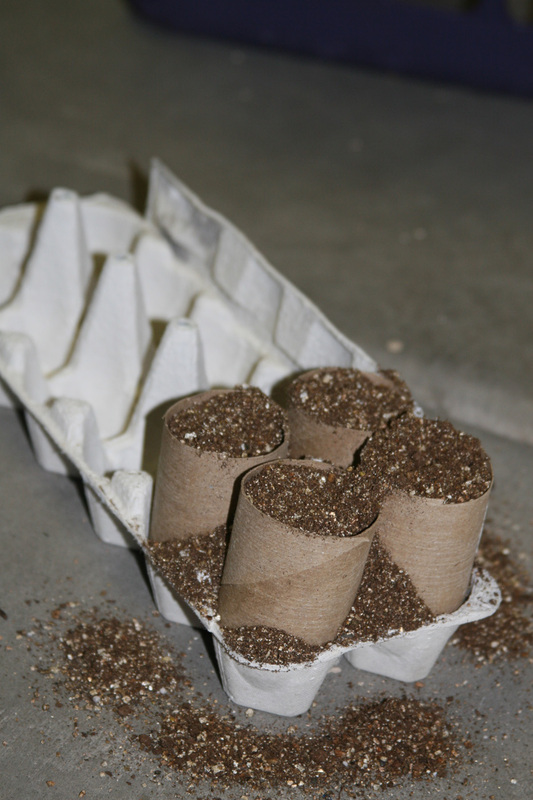 Once sprouted, I can transplant the seeds WITH the toilet paper rolls, which will eventually rot away naturally. Many of the plants I’ve brought home in the past were boxstore-bought, and probably not the pick of the crop. Time after time, I’d lose them each one of them, no matter what tactic I tried. Not enough sun? Moved it? Oh maybe it’s too much – moved it again. Not enough water, too much sun? Or maybe I should let it dry out, get LOTS of sun and….oh, plant, just TALK to me! What do you NEED?! And so it went. I probably shocked them to death. On the other hand, I’ve always been terrified of seeds. I can’t explain why. Growing from seed seemed so complicated and frightening. Seeds. Like babies. Breathing on them wrong could cripple their growth, right? Even opening the seed packets this evening made me shake my head in awe. When I usually think seeds, I think gigantic pumpkin seeds, sunflower seeds, bird seed even! But each of these seeds was something so small and insignificant, so tiny, I would never have looked twice at them out in the wild. To think this tiny wisp of organic matter that could fit three shoulder-to-shoulder through the eye of a needle would grow into such large plants is indeed amazing. Despite their underwhelming size, they still made ME feel insignificant. I handled them like a frightened yet already proud mother seeing this tiny “creature” for the first time, depending on me for everything to make it grow strong and healthy. Previous postAre we all just “armchair experts” on nutrition? Best of luck! Tomatoes are supposed to be quite easy to grow. From my experience growing chillies, they are pretty hardy and easy to maintain too.